Kick off your visit on the 23rd (Sun): take in the architecture and atmosphere at Serbian Orthodox Church, look for gifts at Seven Stones Designer Jewellers, stop by Opalios, then pause for some serene contemplation at Catacomb Church, and finally take an in-depth tour of Umoona Opal Mine & Museum. 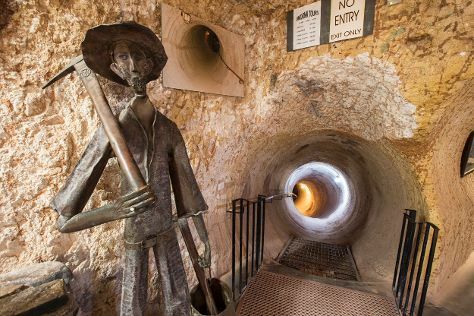 On your second day here, explore the fascinating landscape at Breakaways Conservation Park, look for all kinds of wild species at Josephine's Gallery & Kangaroo Orphanage, and then get engrossed in the history at Old Timers Mine. To see photos, maps, other places to visit, and other tourist information, go to the Coober Pedy trip itinerary planner. Manila, Philippines to Coober Pedy is an approximately 22.5-hour flight. You'll lose 1 hour traveling from Manila to Coober Pedy due to the time zone difference. When traveling from Manila in December, plan for a bit warmer days and little chillier nights in Coober Pedy: temperatures range from 40°C by day to 24°C at night. Finish up your sightseeing early on the 24th (Mon) so you can travel to Greenock. Kick off your visit on the 25th (Tue): do a tasting at Chateau Tanunda, learn about winemaking at Rockford Winery, and then learn about winemaking at Murray Street Vineyards. Here are some ideas for day two: learn about winemaking at Seppeltsfield, learn about winemaking at Langmeil Winery, and then learn about winemaking at Peter Lehmann Wines. To see photos, where to stay, reviews, and tourist information, go to the Greenock road trip planning tool . Use the Route module to find suitable travel options from Coober Pedy to Greenock. Plan for a bit cooler temperatures traveling from Coober Pedy in December, with highs in Greenock at 33°C and lows at 17°C. Wrap up your sightseeing on the 26th (Wed) to allow time to travel to Kangaroo Island. Deepen your sense of the past at sights like Cape Willoughby Lighthouse Keepers Heritage Accommodation and Cape du Couedic Lighthouse. Satisfy your inner culture vulture at Dudley Cellar Door and The Islander Estate Vineyards. Next up on the itinerary: identify plant and animal life at Hanson Bay Wildlife Sanctuary, explore the fascinating underground world of Kelly Hill Caves, sample the fine beverages at Kangaroo Island Spirits, and enjoy the sand and surf at Stokes Beach. To see other places to visit, maps, photos, and tourist information, read our Kangaroo Island trip builder website . Explore your travel options from Greenock to Kangaroo Island with the Route module. Wrap up your sightseeing on the 29th (Sat) to allow time to travel to Adelaide. 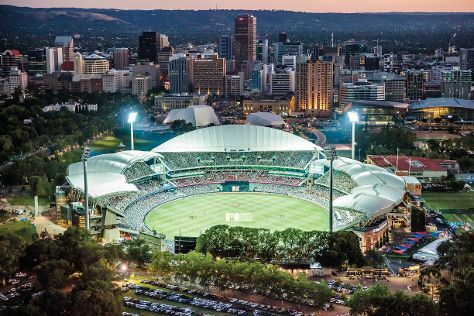 Your inner history buff will appreciate North Terrace and Adelaide Oval. Get a sense of the local culture at National Motor Museum and National Railway Museum Port Adelaide. Step out of Adelaide to go to Cudlee Creek and see Gorge Wildlife Park, which is approximately 44 minutes away. There's much more to do: contemplate the long history of Carrick Hill, stop by Haigh's Chocolates Beehive Corner, take in the architecture and atmosphere at St Peter's Cathedral, and shop like a local with Unique Opal Mine Pty Ltd.
To see reviews, other places to visit, maps, and other tourist information, read Adelaide trip maker app . Traveling by combination of taxi and flight from Kangaroo Island to Adelaide takes 2.5 hours. Alternatively, you can do a combination of car and ferry; or do a combination of car, ferry, and bus. In December, daily temperatures in Adelaide can reach 30°C, while at night they dip to 17°C. Wrap up your sightseeing by early afternoon on the 2nd (Wed) to allow enough time to travel back home.